Single crochet stitches create a dense fabric that makes a sturdy rug. Although you can use any yarn to crochet a rug, cotton yarn will give the rug absorbency and softness and make it easy to launder. Cotton yarn is available in a variety of colors to match any decor. 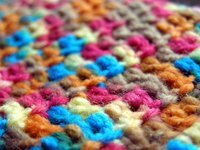 A knowledge of the basic crochet techniques for making chain stitches and single crochet stitches is required for this project. 12 ounces of 100 percent worsted weight cotton yarn, divided into an even number of balls. Hold two strands of yarn from two separate balls of yarn together, make a slip knot with them and place the slip knot on your crochet hook. (See Resources if you need to review how to make a slip knot.) You will work with two strands of yarn for the entire project. Single crochet in the first stitch and in each stitch across the row. If you want fringe on your rug, fasten off at the end of the row and begin the next row back at the first stitch, without turning. Repeat on every row to allow the tail ends of the yarn to create fringe. If you don't prefer fringe, chain one stitch at the end of the row and turn the work. Single crochet in each stitch across the next row, chain one and turn your work. Repeat this step for adding rows until the rug is as wide you want it to be. Fasten off at the end of the last row. Use the yarn needle to weave in yarn tails, unless you followed Step 3 to create fringe as you worked. Try holding two different-colored strands of yarn together for a colorful rug design, or use two balls of a variegated cotton yarn for a multicolored rug with smooth color transitions. Crochet in the round, increasing each single crochet round by six evenly spaced stitches, if you want to create a circular rug instead of a rectangular one. Yarn tends to slide on a smooth floor. Place a nonslip rug pad under your rug or paint the back of the rug with a nonskid rug-backing compound to prevent the rug from moving when you walk on it. "Variegated Rugs to Crochet"; Anne Halliday, 1997.